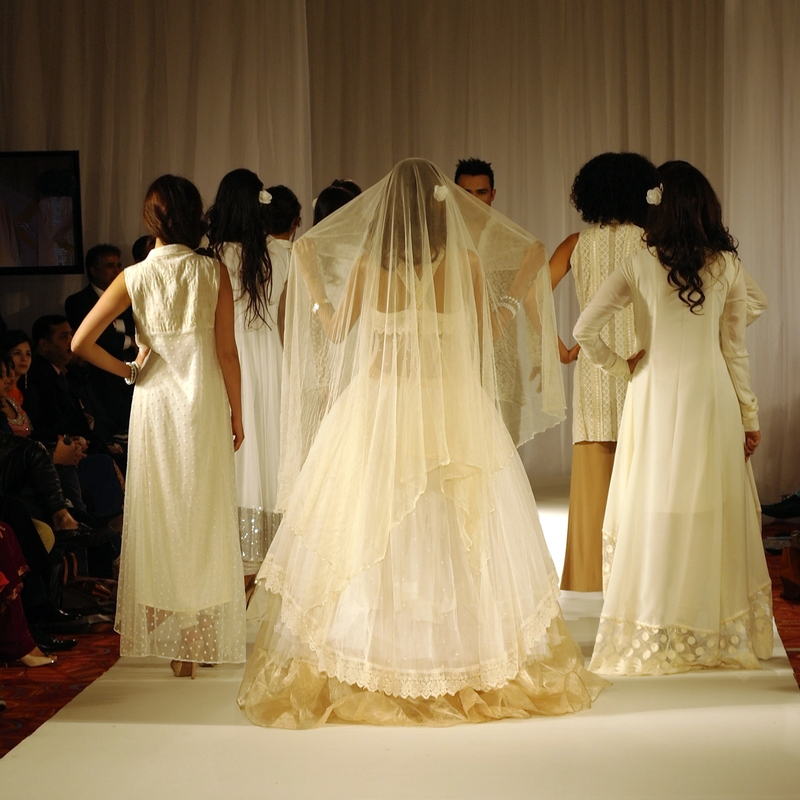 So on the 2nd and 3rd of November 2013, Pakistan Fashion Week held its fifth installment at the Hilton Paddington hotel in the fashion capital city of London. The shows which have been held annually are organized by Riwayat, a company that lives up to its definition as ‘riwayat’ or traditions play a key role in Pakistani culture. The name was specifically chosen by the company’s founder, Adnan Ansari for the platform that brings Pakistan’s best to the European market. Now in its fifth segment, Pakistan Fashion Week LONDON 5 definitely did not fail to impress. The 90ft catwalk featured either top or emerging Pakistani designers such as Gul Ahmed Textiles, Monad, Moazzam Abbasi, Sam & Huma Naz, Ayesha Aejaz, SMK etc. And the accompanying boutique lounge allowed guests the opportunity to purchase quality bespoke designer clothing pieces ranging from modest to slightly less than modest price ranges. The originality of the designs presented by the respective brands all contained a similar theme; Riwayat. They were traditional in the sense that they all paid tribute to the Pakistani sort of Eastern style promoting sequence fabrics and unique embellishments with a large part of most collections calling attention to the ways in which materials flowed and draped ones figure all whilst staying quite contemporary. The main types of fabrics that stayed consistent amongst the collections were velvet, chiffon and silk but the collections viewed were far from monotonous as the signature styled embroidery of each designer gave the pieces their individual edge and captivated the eyes of everyone in the room. Although there were pieces of menswear in the show, the ensembles, few and far between were largely overshadowed by the more prominent and extravagant womenswear outfits. The use of textiles in Gul Ahmed’s collection in particular caught my eye with the surprising synergy of the varying mix and match of prints. As well as Sam & Huma Naz’s representation of multicultural styles that stemmed from traditional Pakistani to Punjabi and even ranged from 70’s themed outfits to those that were Bedouin influenced. Another theme that was apparent from the majority of the collections was the precept of romance, with the dresses ranging from poetic long sheath like lengths to more practical less voluminous tops over palazzo pants. Interestingly a recent trend that has come up in fashion, particularly haute couture, was integrated into the designs of some of the collections. That trend being the cape; which is attached to the back of dresses or jackets and thus creates a fairytale-like impression reminiscent of one’s childhood. It reminded me of the outfit Aladin gets conjured up by the Djinn when he seeks to court Princess Jasmine. Nature was definitely a theme that was prominent in this collection with the inclusion of tree’s and birds woven into a lot of the patterns on the outfits. Of all the textiles in the various collections I do think that Gul Ahmed’s use of prints was the most creative and thus the one that I liked best! This collection was very romantic, it almost carried the resonant motif of coveting one’s lover who seems so close and yet so far. The colour theme was white with very few other colours playing into it but those that did blended in well, mostly being beige and gold with a few passionate reds making an appearance as well. I loved the ball gown worn by the show stopper, absolutely adored it which was surprising as I’m not usually a fan of transparent lace boning. Some of the designs from this collection literally took my breath away. Incredibly stunning! There were more drapey layers involved and so the models just seemed to flow on the catwalk which just made them look really elegant. I started thinking about how much time it must take to create just one of these outfits when I was watching the show, the detail on them; the mesh of prints and patterns, embroidery and the dazzling textiles worked together amazingly well and there’s was so much of it too! Pakistani fashion designers really are on a league of their own. I liked the coordination on the couples outfits, it worked well with the whole wedding theme but I couldn’t help but think that some of the single’s outfits were more extravagant than the couple ones. The designs were very feminine and very fresh as they encompassed their personal influences from Eastern culture but were able to come off as very contemporary. The brand Bridal Couture however is a bit iffy. A lot of women commented on the event page of PFW saying they had paid for outfits and never gotten their money back, so as lovely as the designs were/are, I wouldn’t trust it. One word to describe this collection; sensual. It was quite traditional compared to the other collections and yet contemporary as it sort of rivals the societal conventions of Eastern style by its not so covert celebration of sexuality and the female form. The cuts on the outfits emphasised the models main points of beauty, their waist, their long limbs and their collarbones (one of the parts of our bodies that I personally find the most beautiful). I’ve never particularly liked Asian garments and have always opted out of wearing them when occasions that demand such finery arise but seeing some of these collections may just have changed my mind. I may just don a similar sort of outfit to one of the ones in the pictures above to the next event I’m invited to. If I do (I think I will) I’ll definitely share some of the pictures with you all! Hope everyone has a great coming week!